Will someone please tell the constipated-looking bespectacled manager/cashier at the Sukhadia's sweets counter on Oak Tree Road in Edison/Iselin not to stare at customers like a nitwit? 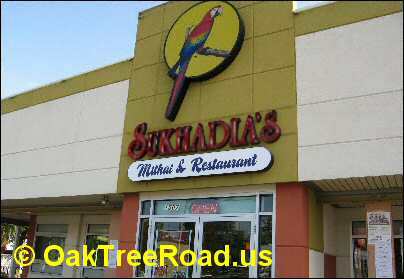 Gosh, how badly has the Sukhadia's location in Edison (New Jersey) fallen! Much to our dismay, the quality of Sukhadia's sweets and snacks at the Edison location has steadily deteriorated over the last few years. 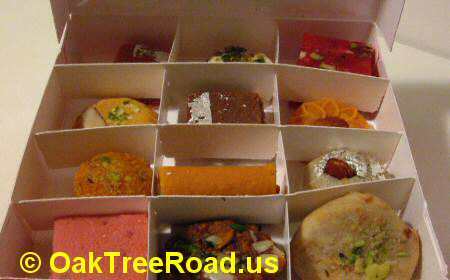 During our latest visit to Sukhadia's on Oak Tree Road, we tried several sweets and ended up mostly disappointed. Our first bite into the Almond Pista Roll and we screamed Yeeks! The Almond Pista Roll had such a stale taste that we were sure it must have been prepared when dinosaurs were still roaming around the Edison area. Although a terrible disappointment, we thought the stale Almond Pista Rolls were an aberration. Little did we know of the agony that lay ahead of us. Almond Poori was a bitter disaster and tasted as if it'd been made specially for diabetics. The two Almond sweets were enough to tarnish Sukhadia's reputation. Boondi Laddu was again slightly short of sugar. Come on, Boondi Laddu is one of the most common Indian sweets, made and enjoyed both in North and South India. By now we were hopping mad. If a sweetmaker can't get the humble Boondi Laddu right, what in the world can that bozo get right? Kesar Peda and Malai Pedas were gratuitous insults, lacking flavor as well as enough sweetness. The Kesar Peda was also a bit stale. If only Sukhadia's would pay as much attention to quality as it did to its recent renovation, customers would get better sweets and snacks. Halvason and Chikoo Burfi were the only sweets that we found palatable. Although tasty in comparison with the other sweets, they were nothing special. It's not just the sweets that have deteriorated at Sukhadia's Edison location. Even Sukhadia's snacks have lost their charm. For instance, banana chips were neither spicy nor was there any evidence that salt had even been added to it. Perhaps, Sukhadia's ran out of salt and chilli powder when the banana chips were prepared. 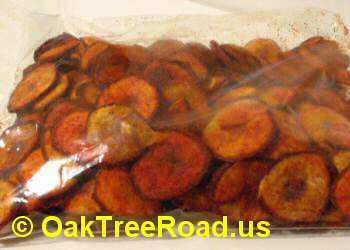 Oddly enough, the banana chips looked so reddish that when we purchased it we were sure it would be real spicy. Must have just been some food color. Boy, were we duped. 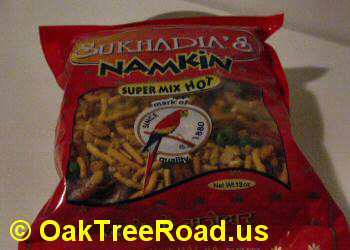 As for Sukhadia's Super Mix Hot, the less said about this horrendously bland snack the better. Don't even go near the Sukhadia Samosas with their tasteless filling. Like the quality of its sweets, Sukhadia's service has also slipped considerably. We found the sullen counter assistants to be borderline rude. Also, why can't the lazy slobs at Sukhadia's put up a name tag for each of the sweets? That would make things easy for customers. The old geezer at Sukhadia's cash counter also failed to give us an itemized bill for the different items we purchased. All in all, Sukhadia's sweet store on Oak Tree Road in Edison/Iselin is no longer worth visiting. If it's genuine, tasty Indian sweets you are looking for, then Sukhadia's is not the right choice.